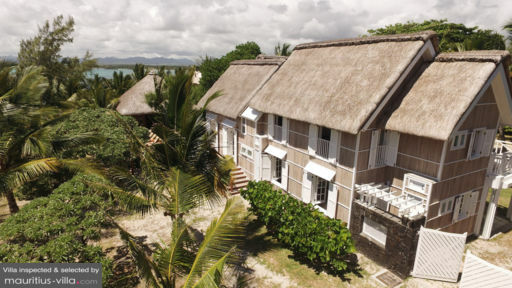 This wonderful Mauritian home is located on the east coast of the island in Poste Lafayette where the infinite azure blue ocean blends in beautifully with the clear blue sky. Villa Chateau De Feuilles is the perfect place to spend time with your family, enjoying nature walks, swimming in the pool or in the sea and sunbathing. Visiting the islands capital Port Louis or Grand Baie, the islands most popular beach resort town make nice day-trips before returning again to your own peaceful sanctuary. Villa Chateau De Feuilles will steal the hearts of those wanting to stay somewhere unique and authentic surrounded by nature and overlooking the ocean. This two storey villa features beautiful bamboo walls with white-painted panel windows and a tropical thatched alang-alang roof. Inside the pavilion is spacious and bright, decorated elegantly with painted tiles on the floor and a classy white interior design. The dining area has a chic and stylish feel and in the living room there is not only a comfy sofa lounge but also a grand piano. 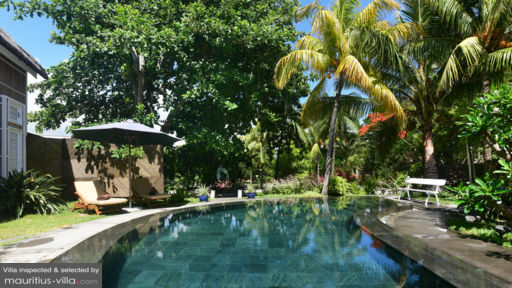 The garden features a stunning free-form swimming pool surrounded by lush tropical greenery and trees, making it feel like a private tranquil oasis. You can choose to swim in the ocean or in the pool and afterwards you can soak up the sun on one of the many sun-beds, catching a lovely tropical tan. The charming garden balé is great for dining and lounge alfresco style, overlooking the sparkling pool and the breathtaking ocean. There is also a romantic antique swing-bench to watch sunset in a more intimate setting. 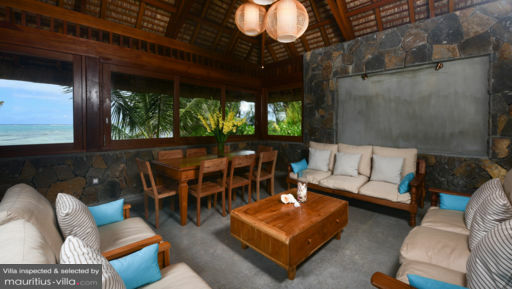 The villa features a total of six air-conditioned bedrooms on the first floor of the pavilion. The rooms are designed tastefully, characterized by an individual colour theme and they feature deluxe beds and marble en-suites. The villas staff consists of two maids and a gardener who will keep your holiday home spotless and beautiful.